I've already mentioned that I've sort of been binge consuming on Anthony Bourdain related content in recent weeks for one reason or another. And I'm not ashamed of this fact - his take on the world of cooking and perhaps food in general is refreshing, honest and uncompromising. And this show in particular caught my interest quickly given it's rather practical premise. The Layover is not your typical travel show. Sure each episode is focused on some new city. Yes, every time he explores the food options. But the decision to wrap the whole thing within the limited time of a layover? That's where the show really makes its mark. Anthony Bourdain isn't your typical travel host, I must admit. It's not going to be all sunshine and roses. He's not going to highlight different tourist attractions that are a must-see in each city. This is about making the most of the very little time that you have - a focus that distills a city down to its more interesting bits and perhaps some of its best food. 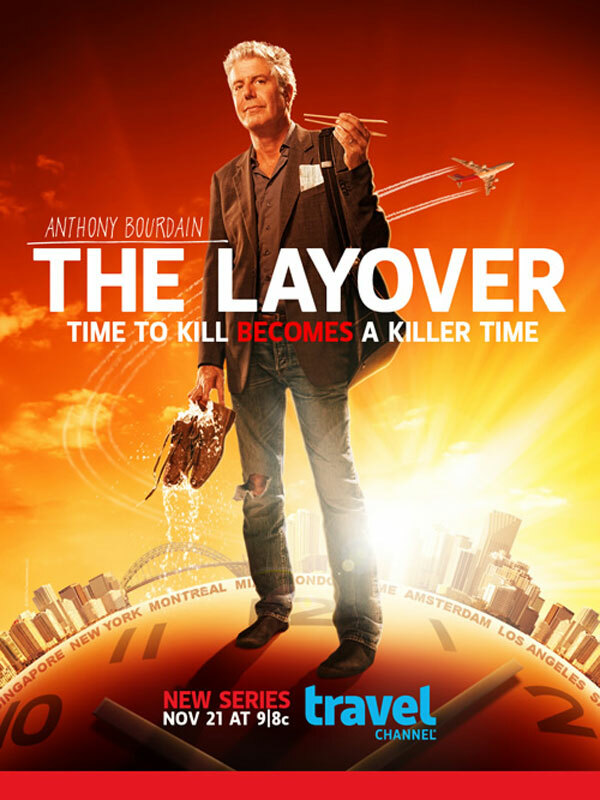 Synopsis: The Layover is a travel and food show that debuted on the Travel Channel. It was created by Zero Point Zero Production Inc. and featured Anthony Bourdain as its irreverent host. The show's premise relies on Bourdain's wealth of experience as both a chef and world traveler. And thus the decision to wrap everything up within the time frame of a layover - one that spans less than a day to maybe almost two. That's not enough time to gawk and stare at all the pretty things in a city. It's all about making smart decisions and knowing how to get around the city. Naturally the bigger focus on each episode are good food options in each city. And thankfully good doesn't necessarily mean expensive - Bourdain is certainly the kind of guy who's willing to go to some pretty interesting lengths in the name of new food experiences. Each episode is crafted in such a way that the actual map locations of each featured establishment are generally presented to us viewers, although you'd probably need to DVR the show in order to pause as needed and take notes. Things go fast and furious and so you need to pay attention. And of course he manages to connect with some friend from the culinary world or at least a local contact provided by the producers in order to show him some interesting new areas of the city to explore. There's a common thread among many of his friends - one that tends to involve a lot of drinking and a rather colorful history. But if you've read any of his books, then you'd totally understand why this is so. In many respects, this is already part of Bourdain's personal brand, as it were. To be fair, it's not entirely about food all the time. I've seen him stop to get a new suit made or even a pair of custom-made shoes. A lot of these decisions remain more oriented towards the business traveler - in other words, the type of person most likely to find themselves on a layover. And this totally works for me in terms of the show's core premise. For those who want to know more about the city in focus outside of Bourdain's particular range of interests, another camera crew still seems to go around town and take additional footage that Bourdain gets to narrate in post-production, apparently. And it's fun how this happens since it just shows that even though he's the host, he's not going to do everything that the producers want. And he will openly mock the fact that he can't change his shirt in the name of visual continuity and other annoyances as part of his overall narrative. The Layover is a delight of a show, and one that provides some great options for anyone who finds themselves in a foreign city for a day with no immediate plans. Anthony Bourdain may not be the friendliest sounding guy on the planet, but he's certainly an honest one who will set you on the right path. The show's two seasons certainly deserve a full 5 instances of Bourdain mocking the weird travel guide the producers provide him for each city out of a possible 5. Glad the article was able to help you! Pinakuha pa po b kau ng cedula? Yes, a copy of your cedula is required.